Matt Carrano examines one of his works at his studio in Somerville. “Somerville Open StudiOS changed my life,” says Nancy Anderson. This was a few years ago. Anderson, a 49-year-old Randolph native, had studied art in high school but had never gone to art school. She hadn’t picked up a paint brush in years. At the time, Anderson was working in “corporate America,” in what she calls “a fluorescent-lit cubicle farm.” On a lark, she and some friends went to visit Somerville’s annual Open Studios. Anderson was awestruck by the art she saw. “I just inhaled the aroma of the solvents and paints, to me it was just an inspiring aroma.” Moreover, she said she was “floored” that she could meet the artists who had made the work. “You mean you can go and you can just go into where these artists are working and ask them about it?” she remembers saying to herself. Seeing the art set into motion a cascade of change over the next few years. She quit her corporate job, moved to Ball Square in Somerville, and started a business as a dog walker and canine herbalist. She started taking art classes and began to paint. Last year, at Somerville Open Studios, she showed her work — big, bold portraits of, you guessed it, dogs. Her first show. For sure, these peeks into artists’ workspaces are, first and foremost, opportunities for the public to experience art. But the artists themselves offer myriad reasons why showing their work can be helpful, or even critical, to their careers. Some cite community building and networking. Others want to make sales, get rid of old work (at cheap prices), or need an excuse to gussy up their workspaces once a year. For others, like Anderson, open studios provide the psychological step of setting a deadline and putting themselves, and their work, out there for others to see and judge. 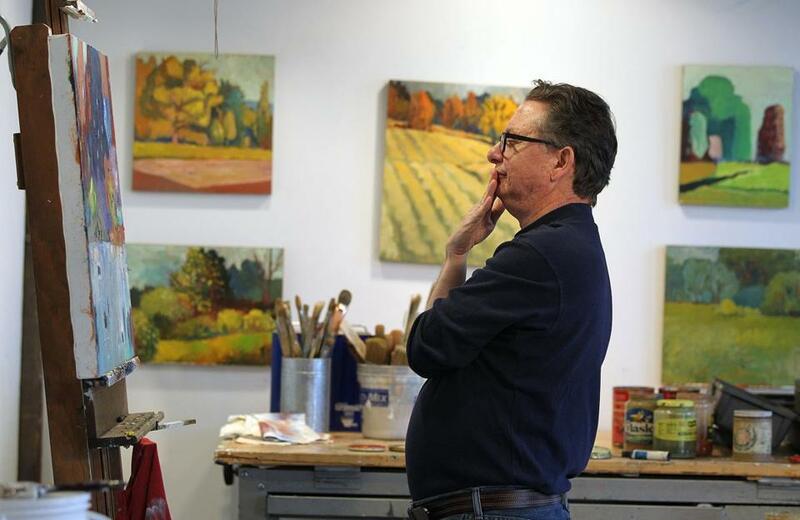 Artist Jeffrey M. Fine in his studio in Newton. Indeed, the brave act of exhibiting one’s collages, jewelry, prints, furniture, handmade books, or mosaics to the public can help cement one’s identity ­— and push a hesitant painter, photographer, or ceramicist into self-identifying not only as an amateur but as a true artist. “I just threw my stuff up on the walls. All of a sudden, I started getting phone calls and e-mails from people. It was very affirming,” Anderson recalls. 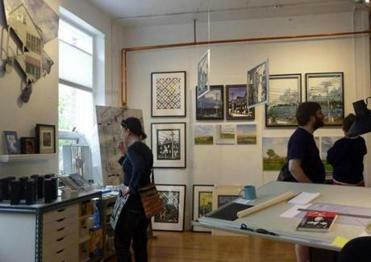 An open studio has been the stage for many an artistic debut. The general public can also be naive about the mysteries of artistic creation. If you’re a teacher or a programmer or a car mechanic, people know what those professions are like, Mello says. “You say you’re an artist, what does that mean? What does your office look like? You can start to look around. See the coffeepot and the stereo.” And the piles of paint tubes, or wood shavings, or tubs of wonderfully toxic potions. See an art space, and the “how” an artist makes work comes into focus. Visitors to open studios get to see the creative process up close. “The idea of ‘studio visits’ goes back at least to the emergence of independent artists working for paying clients and patrons in the wake of the French Revolution,” says Matt Kaliner, who is completing a dissertation in sociology at Harvard that explores, in part, open studios and art communities in relation to change in Boston area neighborhoods. Kaliner says by the early 20th century, Rockport, the Fenway Studios in Boston, and other artist communities across New England hosted tours of artists’ homes and studios. Which local community had the first modern open studio — with the aim to create a market independent of galleries and museums — is a point of contention. “Each say they’re the first,” Kaliner says. But according to a book called “Painting in Boston, 1950-2000,” published by the deCordova Sculpture Park and Museum, in 1969 a group of artists unable to show their work in Newbury Street galleries banded together as the “Studio Coalition” and held the first Boston-area open studios. Waltham Mills Artists Association, in 1976, and an event called “ArtWeek Boston” in 1978, also led this artistic revolution. Other communities like Fort Point in Boston, and Vernon Street Studios and Brickbottom Artist Association in Somerville, followed in the 1980s. Then came what Kaliner terms “the real explosion” of open studios in the 1990s and 2000s. 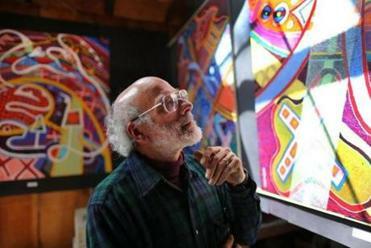 In his research, he’s also drilled down into census data to determine the number of artists in metro Boston. A 2009 survey puts that number at 1,942 — counting only those who live in Boston, Somerville, Cambridge, Newton, and Brookline and “self-identify” as artists. 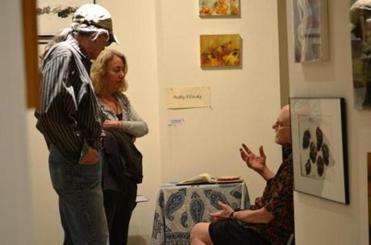 Open studios also provide a chance to talk with the artists. With a map in hand, visitors select what artwork looks interesting, and embark on their own self-guided tours into strange, new neighborhoods. That ability to snoop in a private home or converted factory not only satisfies our curiosity of what goes on in there, it also lets people see their own neighborhoods anew. At the Newton Open Studios event in early April, a group of three female friends and one of their daughters hoped to sell their paintings, jewelry, digital art, and silk chiffon scarves on display in a bank lobby. One advantage of the open studios, they all found: direct sales to customers, and no sharing with a gallery. Ethan Gilsdorf is the author of “Fantasy Freaks and Gaming Geeks: An Epic Quest for Reality Among Role Players, Online Gamers, and Other Dwellers of Imaginary Realms.” Contact him at www.ethangilsdorf.com or follow him on Twitter @ethanfreak.